No matter how brave you are sometimes weather conditions keep you from conquering those trails. This is especially true as the mercury drops and turns our beloved Earth into something reminiscent of the Russian front. Luckily, there are plenty of ways to have fun with indoor biking. Most gyms offer spin classes. These classes use a stationary bicycle, music, and instructors to guide a class through about a 1 hour workout. 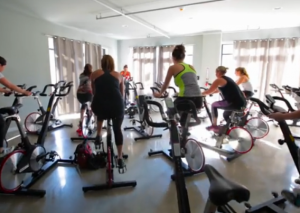 Spin classes are a source of indoor biking, and it gets you out of the house. There are, however, a few downsides with spin classes to keep in mind. One issue is that a spin bike won’t fit the same as your own bike. To fix this, many riders will install their own saddle and pedals on a spin bike before each class. The other potential problem is that the classes are not tailored toward your personal goals. The classes are usually high tempo, high effort workouts that might not fit with your training plan. Some riders find they like the community of spin class but not the specific ride, so they opt in or out of certain portions of the wworkout. 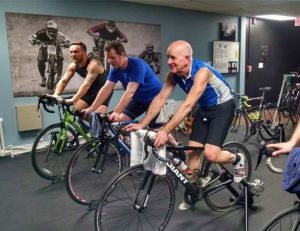 Riding an indoor trainer has gotten much more popular for riders of all ability levels, and it’s the kind of indoor biking where you can use your own bike. A trainer is a device that holds your bicycle upright, creates resistance when pedaling, and simulates an outdoor ride while riding your bike indoors. 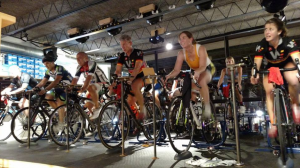 Using an Indoor trainer, you can ride from the comfort of your own home, or in a group setting (most bike shops have trainer nights through the winter). There is usually a leader when riding with a group, but if riding alone, you can still have fun. It’s best to start with a plan. If you intend to just get on the trainer and ride for 60 minutes while watching TV, I hate to break it to you, but that quickly gets boring. So how do you keep the ride fun? First, you cannot rely on terrain to supply stimulus so you must create your own intrigue. There are no hills, descents, turns, or beautiful vistas to keep you interested. But you can use your trainer to mimic the efforts of a great outdoor ride. Follow that by slowing that cadence down over the next two minutes. Followed that by one or two minutes of soft pedaling (hard effort for the climb, followed by no effort on the descent). Repeat this type of interval in groups of three. Then sprint all out (max effort) for fifteen to twenty seconds. Follow each effort with some soft pedaling. A ride like the one above takes one hour, keeps you moving, and only involves hard effort for ¼ of the ride. By switching up different intervals of effort and rest, indoor biking can be beneficial and very fun. 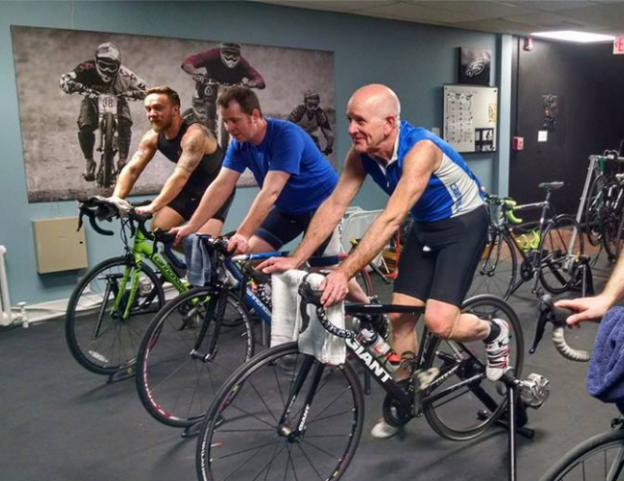 Time on the trainer can be very beneficial to your riding, but it can also be very hard on you if done improperly. When riding outdoor, you have natural portions of rest while coasting or descending, but on an indoor trainer you cannot coast. People tend to pedal at effort on a trainer throughout the entire ride and overdo it. A good rule of thumb is to balance high effort with rest at a three to one ratio. If a ride calls for 10 total minutes at 80% effort, be sure to include 30 total minutes of low effort work. How do you keep the ride interesting without effort? Try including drills like one leg drills, high cadence drills, spin up drills, top only drills, and toe touch drills. These require very little effort but build new skills. One leg drills – Like they sound, these drills are done with one leg (see above). Clip your right leg out of your pedal, hang it away from the bike, and pedal with only your left leg. Try to get the pedal stroke to be as smooth as possible, without any noise or bumps. Spin-up drill – With your bike in an easy gear, try to spin the pedals as quickly as possible. Keep increasing your cadence until your upper body begins to bounce, then taper back to a normal speed. Repeat, each time trying to get faster while keeping your upper body still (this whole drill takes about 30 seconds per spin-up). High-cadence drill – With your bike in an easy gear, spin at the fastest cadence you can without your upper body bouncing. Hold that cadence for one or two minutes. Top only drills – Try to pedal using light effort and attempt to keep the top of your foot in contact with the top of your shoe throughout the pedal rotation. You won’t actually be pressing down on the pedal during this drill, but instead pulling up. Toe touch drills – While pedaling, attempt to touch your toe to the front of your shoe at the top of each pedal stroke. 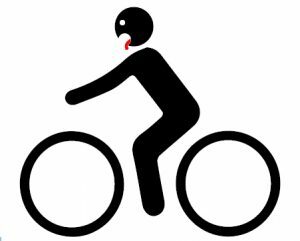 While this isn’t possible, it will help teach your body to begin the pedal stroke earlier in its rotation. With a little research and a little experimentation, indoor biking can keep you satisfied while you wait for the weather to get better. sign up for our free, weekly, E-Magazine for more great content! This entry was posted in News and tagged bicycle trainer, bicycle trainers, bicycle workout, Bike trainer, Bike trainers, bike workouts, group ride, group rides, indoor biking, indoor ride, riding indoor, riding indoors, riding on a trainer, trainer ride, winter bicycle, winter bicycle ride, winter bicycle rides, winter bike ride, winter bike rides, winter ride on November 20, 2018 by John Brown.